In the heart of the Julian Alps, a jewel glistens – a fairytale emerald lake with an enchanting island. Take a deep breath and let the fresh mountain air invigorate you. People have always believed that the fairytale nature, mild Alpine climate and harmonious energy of Bled have an almost miraculous healing power. Romantic walks or a horse-drawn carriage ride around the lake, a ride in the traditional “pletnja” boat to Bled Island, a visit to the magnificent castle ruling the rock cliff above the lake and, last but not least, enjoying the creamiest and most famous Bled dessert, the original Bled cream cake – Bled is a superlative holiday destination! Be it swimming in the lake, hiking, cycling and golfing in the summer or skiing on the nearby slopes and soaking in the thermal water pools while enjoying the enchanting views – Bled will captivate you in every season! Take a row boat out on Lake Bled and enjoy a private picnic in the middle of this beautiful lake in the heart of a pristine natural environment. You can also row to the nearby island and enjoy some breath-taking views. Row boats can be rented in the boat house of the Grand Hotel Toplice. If you decide on the romantic package, the boat rental comes with a picnic basket full of delicious foods. Experienced guides will take you to an adrenaline-filled 2–3 hours long trip along the Sava Dolinka river valley, where you will learn about the natural phenomena of this protected natural monument with incredible value, which is also part of Natura 2000. You will cross the valley above the river via 5 ziplines with a total length of 2.4 km. At the beginning of the Selo village, above the Mulej farm, you can find Kral’s beehouse, an educational apiary with around 50 beehives. In this apiary, with hand-painted panels, queen bees and bee families are reared. The beekeepers will present the life cycle of the Carniolan honey bee, the work at the apiary and the production of honey. This easy cycling route runs through the idyllic Alpine valley of the Radovna River, from the Krnica village to the museum in the Pocar homestead, one of the oldest preserved in the Triglav National Park. We suggest that you stop on the way to see the 500-year-old Gogal linden tree and Napoleon’s stone from the time of the Illyrian provinces, visit the karst source at Lipnik, and jump into the Kreda lake. The image of the lake with the island is one of the most typical of Slovenia. The island was once a temple to Živa, the goddess of love. Today, it is the home of the romantic small church of St. Mary Help of Christians with a famous wishing bell dating back to 1943. The island is accessible by traditional “pletnja” boats and rowing boats. A steep cliff overhanging Lake Bled is the home of the oldest castle in Slovenia, offering a spectacular view of the lake and the surrounding mountains. Throughout the year, the castle courtyard hosts numerous events and visitors can take a tour of the castle printing works and the herbal gallery. There is a rule in Bled: if you have not taken a ride in a “pletnja” boat, you have not visited Bled for real. The “pletnja” is a traditional wooden boat built by locals. It is unique to Bled. Take a seat for a ride to the island and sightseeing from the lake surface. A fiacre, the traditional Bled horse-drawn carriage, is another custom that has been conveyed from one generation to the next. The carriage drivers are distinguished by traditional livery. They will take you for a ride around the lake or sightseeing in the surrounding area. Situated southeast of the lake, the Straža Hill is considered an exceptional vantage point. The Bled fitness trail runs through meadows and forest (fitness in nature). A chairlift will take you to the top of Straža. Adrenaline lovers can ride the summer sled track or visit the adventure park. For fairytale fans we recommend a visit to Fairytale Land, where folk narrative is spread through fairytales. This is the home of fairies, the Heathen Maiden, the Goldhorn poachers, the Tree Gnome, the Wild Woman from Babji zob and the Water Man. By telling folk tales, the characters create an unforgettable experience for children. Ojstrica is known especially for its magnificent view of Lake Bled and the Sava plain. The most beautiful panoramic photos of Bled are taken here. Named after the highest peak in Slovenia, Triglav, the Triglav National Park stretches across almost the entire Julian Alps. It is an indisputable treasure trove of natural sights: a diverse pristine landscape with mountain peaks, gorges, mountain villages, water sources and rich vegetation. In a panoramic ride in a hot air balloon operated by a licensed and experienced pilot, you will cruise over Lake Bled and enjoy an aerial view of the island and the surrounding peaks. Reservations can only be made at one of the hotel receptions. Bled has always been a fairy-tale place, as a wealth of ancient legends testifies. The best known is without doubt the legend of the sunken bell and the origin of the wishing bell. 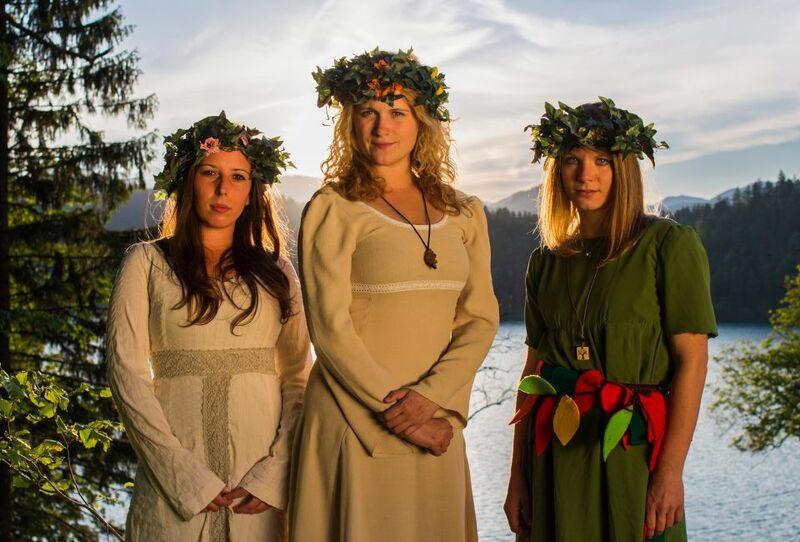 Also interesting is the legend of fairies visiting Lake Bled. The beauties of Bled are described in the poem The Baptism on the Savica written by the greatest Slovenian poet France Prešeren, saying that there is no place more beautiful in Slovenia than Bled, a “paradise serene”. The tourism boom at Bled was significantly boosted by the healer Arnold Rikli. The powerful tradition at Bled is also testified to by the pletnja boat rowers and the fiacre coaches.